It appears the gentrification wave in Indianapolis may soon be dealt a serious blow with the loss of the two primary downtown grocery shopping locations. 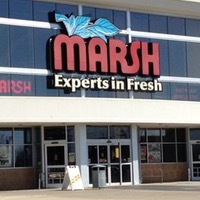 The Indianapolis Star reports that Marsh yesterday informed the Indiana Department of Workforce Development that it may have to close 17 stores, including those at 227 N. Michigan Street and 320 N. New Jersey Street, if it can find a buyer soon. Despite younger professionals moving downtown the area has struggled to retain shopping opportunities. Other Indianapolis stores are on the list including 1435 W. 86th Street, 6965 W. 38th Street, as well as a Marsh stores in Broad Ripple. My local Marsh, which is a smaller store at 56th and Georgetown, is, thankfully, not on the list. Not yet at least. Marsh notice to IDWD indicates that the 17 closures would mean the layoff of 1,535 employees. Now Marsh is closing all their stores unless they get a buyer. People in the Broad Ripple area have known for a long time that the store would be closing. They have yet to mow the grass, and shelves have only a front row of things like cans, to make it look like they aren't empty. Things like cake mixes are already past their expiration date, and the stores look deserted.